From Los Cabos and Puerto Vallarta to Cancun, Jamaica and even Costa Rica, the AMResorts hotels line the coasts of some of the most stunning beach destinations. They offer vacations for every type of traveler, catering to families, couples, wedding groups and more. 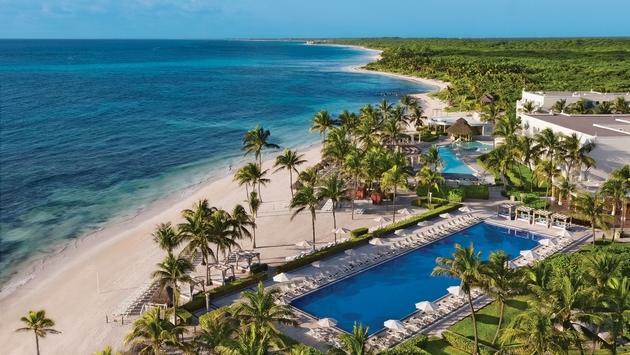 Apple Leisure Group knows it can be overwhelming to try picking out the best resort and put together a guide for those travelers looking to plan their vacation with AMResorts. First up is Zoëtry Wellness & Spa Resorts, perfect for vacationers who enjoy top of the line luxury and a laidback atmosphere. These properties are also great for those who enjoy health and wellness, as they offer healthy meal choices, spa treatments and more. Secrets Resorts & Spas are adults only properties that make wonderful honeymoon and anniversary retreats. Couples will find a romantic vibe on a beachfront setting. On the other hand, singles and groups of friends may prefer to choose Breathless Resorts & Spas. With DJs and pool parties, these resorts offer unbelievable social scenes. Families have several choices when it comes to vacationing with AMResorts. Dreams Resorts & Spas and Now Resorts & Spas both have their own unique personalities and traits, but both brands offer fun-filled vacations for families with members of all ages. Sunscape Resorts & Spas are also great for family vacations and are AMResorts' most budget-conscious brand. Travelers who want to discover AMResorts’ newest brand will want to check out Reflects Resorts & Spas, great for all ages. Visit the Funjet Insider to learn more about this collection of resorts offered by Apple Leisure Group.